Washington Oaks Gardens - Palm Coast, Florida "Midsummer's Rain and Flowers"
Come explore the lush garden paths and tropical foliage at Washington Oaks State Gardens. This is one of our favorite places to come and take a walk and relax. There are open areas to run, picnic areas on the Intracoastal Waterway where you can fish, an interpretive center, a formal rose garden, a butterfly garden, sulpher ponds and koi, a gazebo and more. This location is host to many interesting and popular events throughout the year, such as the Earth Day Celebration, and The Holiday in the Gardens, where they decorate the gardens with lights and festive adornments. There are two parts of Washington Oaks Gardens State Park the Gardens, the oceanside. The Oceanside has a parking lot and a boardwalk leading to the Atlantic Ocean. Miles of undeveloped coquina beach can be seen in each direction. While we were there we saw several Sea Turtle nests that were roped off, protected, as the eggs incubate. In the tidal pools we saw some interesting living crustaceans, I think that they were living coquina, swimming and diving into the sand. The coquina rock formations that can be found on the beach are unique to this area. 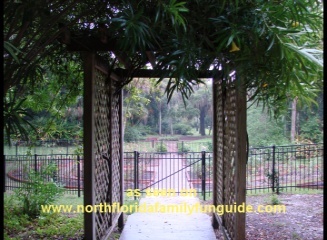 Enjoy the natural side of Florida and check out Washington Oaks Gardens!